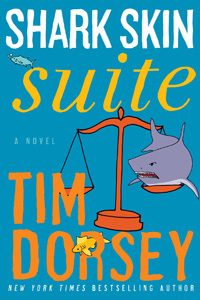 Shark Skin Suite by Tim Dorsey: Synopsis and Online Purchase Options. Synopsis (from the publisher): When it comes to swimming with the sharks, there is no bigger kahuna than Serge Storms. Binging on a marathon of legal movies set in Florida, Serge finds his calling: the law. Never mind law school or that degree, Serge becomes a freelance fixer — wildcat paralegal and pilgrim to the hallowed places where legal classics of the big screen such as Body Heat, Cool Hand Luke, and Absence of Malice were filmed practically in his own backyard.